Is This the Earliest Photo of an Indiana High School Basketball Game? 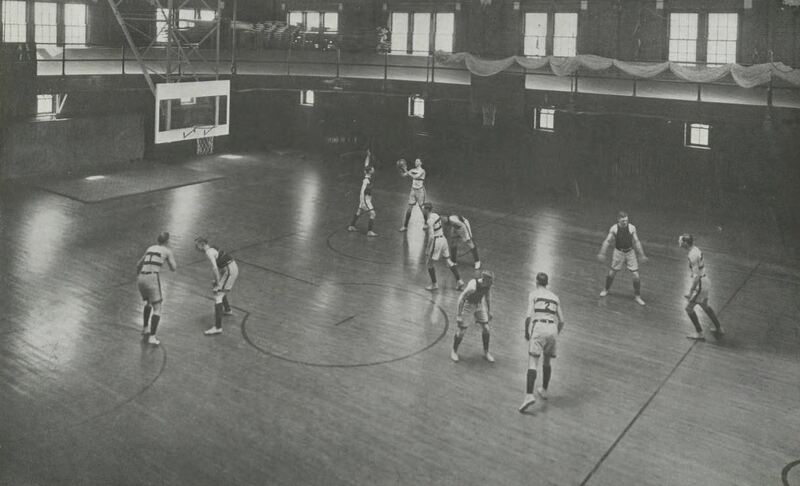 This may be the earliest photo of an Indiana high school basketball game. Wingate High School vs Kokomo High School, January 16, 1915 at Kokomo Y.M.C.A. Source: Kokomo High School yearbook, The Sargasso, 1915, accessed via Howard County Memory Project (howardcountymemory.net). For all of basketball’s cultural worth to the state, finding a photo of a basketball game from before the 1920s is a difficult task. Early basketball team photographs are rather plentiful, and frequently appeared in yearbooks, and newspapers. Action shots are much rarer, likely due to early-20th century Hoosiers having cameras that required long exposure times, which were unable to clearly capture moving subjects. The introductory photo at the top of this blog post is the earliest that the Indiana Historical Bureau has yet to encounter of Indiana high school basketball players on the court, and about to play a game. The story behind the picture is an interesting one. The photo depicts the teams from Wingate High School and Kokomo High School before a January 16, 1915 game at the Kokomo Y.M.C.A. This moment was photographically commemorated because Wingate was the defending state champion, having won back-to-back titles in 1913 and 1914. Situated in northwestern Montgomery County, Wingate was a small school with only 67 students. Among those enrolled in that student body, however, was one of the best Indiana basketball players of that generation, Homer Stonebraker. The 6’4″ Stonebraker was a giant among his competitors. In 15 of the 18 box scores that research could uncover from Wingate’s 1913-14 regular season, Stonebraker averaged 24.9 points a game. By comparison, Wingate’s opponents only generated 17.3 points a game. After leading Wingate to consecutive state titles, Stonebraker graduated in 1914, and matriculated at Wabash College where he continued his athletic success and eventually carved out an eleven season career playing with professional clubs and early American Basketball League affiliates like the Fort Wayne Caseys, the Detroit McCarthys, and the Chicago Bruins. 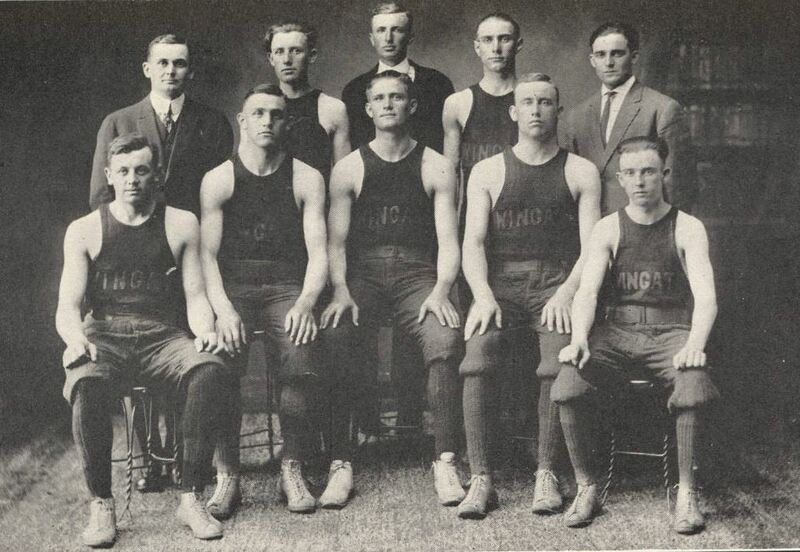 Wingate’s 1914 championship team. Stonebraker is seated in the middle of the first row. Source: Indiana High School Athletic Association Annual Handbook for 1914, accessed via Indiana Memory. This game Saturday will be the most important home game for the locals this season. Wingate’s team is a real championship contender again this year and a victory for Kokomo would mean that we also have a team of first class ability. The very calm composure of the players in the photo taken before the game hardly indicated the animosity that developed in the ensuing contest. Kokomo lost the contentious game 31-15. The Indianapolis Star reported that “Wild scenes, which threatened frequently to break up the game, marked the second period of play and may result in . . . breaking off athletic relations.” The hired referee failed to show up for the game. Consequently, the two schools agreed to let a representative of each of the respective teams officiate one half each. Wingate led 13-7 at half time with Kokomo’s ex-player Tyner Spruce officiating. Wingate’s coach Hugh Vandivier refereed the second half and according to the newspaper reports showed favoritism to his own team, which drew the ire of the Kokomo fans. Ultimately, both squads would finish the season with disappointing records [Wingate (11-8) and Kokomo (7-10)], and neither team would advance out of their division tournaments to qualify for the state tournament. 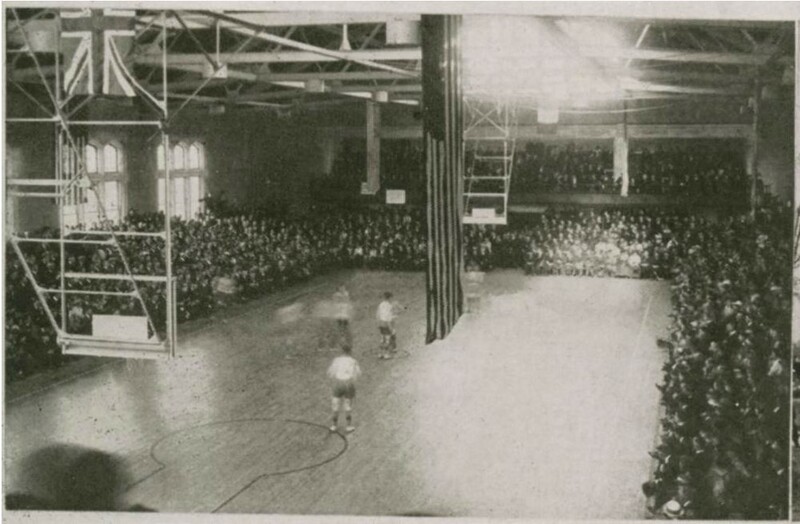 1918 state championship game between Lebanon and Anderson at Indiana University’s “New” Gymnasium. Source: Indiana University yearbook, The Arbutus, 1918. Attempts at basketball action photography continued to be a novelty throughout most of the 1910s. The 1918 title game between Lebanon and Anderson is one of the earliest-known attempts to photograph an Indiana high school championship game. Even then the visual chronicle leaves much to be desired, as the camera’s exposure time had yet to catch up to the action on the court. All of the players are out of focus, and several are nothing more than blurs in the image. Despite this, these pictures can give modern viewers small windows to glimpse the earliest years of Hoosier Hysteria. 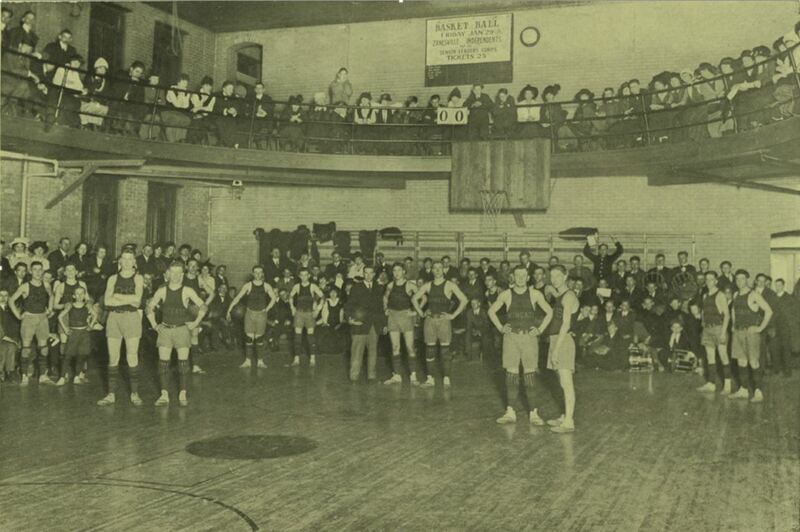 For your bonus enjoyment, here’s another photo of a non-high school basketball practice from the 1912 Purdue University yearbook, The Debris. This photo is likely posed, which is why all the players are in focus with the exception of the top right defender’s blurry arms. Purdue University yearbook, the Debris, 1912. Credit: Archives and Special Collections, Purdue University Libraries. Do you know of any Indiana basketball action photographs that are earlier or contemporary with these shown here? If so, let us know at ihb@history.in.gov.